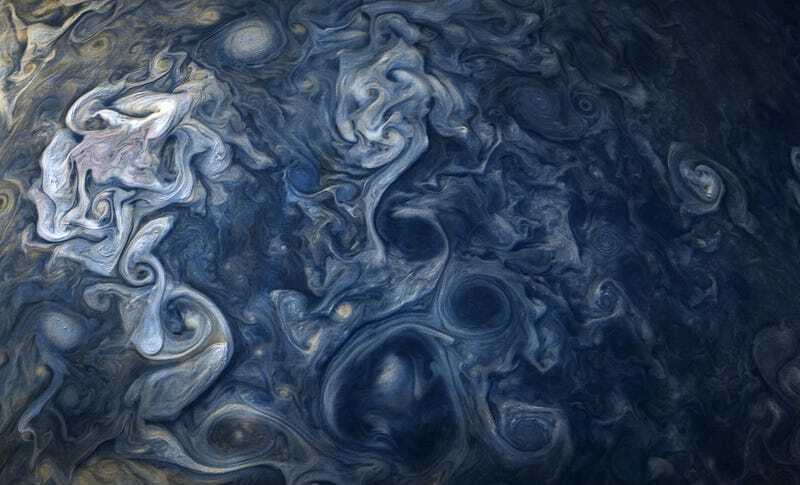 A glorious shot of Jupiter’s swirling cloud tops. NASA’s Juno space probe has been circling Jupiter for the past 20 months, and it’s been transmitting scientific data back to Earth at a furious pace. Today, astronomers are releasing four new studies based on Juno’s measurements, all of which explore the gas giant’s turbulent atmosphere and the stuff that lies beneath its cloudy surface. As their results show, the largest planet in our Solar System is even more exotic than we realized. 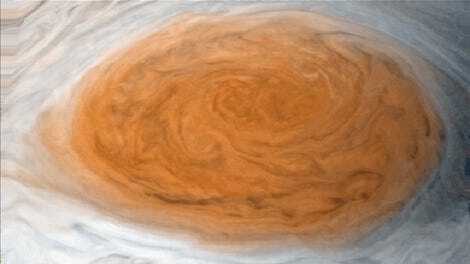 Gazing intently at the cloud tops, scientists have acquired a two-dimensional perspective of Jupiter. Its winds could be shallow, extending no more than 60 to 200 miles (100-300 km) in depth, or they could go much, much deeper. Busy giant: time-lapse sequence taken by the Voyager 1 space probe as it approached Jupiter, showing the motion of atmospheric bands, and circulation of the Great Red Spot. At greater depths, the gaseous atmosphere transitions into a super-dense liquid comprised of hydrogen and helium; this massive, internal ball could feature currents, bands, and other hidden internal dynamics, or it could just be single, giant fluidic mass. Again, we just didn’t know. And as for the planet’s center, that’s one of astronomy’s biggest mysteries—Jupiter’s pit could be a solid rocky core, a metallic mass, a dense liquid, or something even more alien. Thanks to the Juno spacecraft, however, our two-dimensional view of Jupiter is quickly expanding out into three-dimensions. This space probe was designed to measure Jupiter’s magnetic field and polar magnetosphere, but it was also built to gaze through its opaque clouds and investigate the planet’s gravity field, mass distribution, and deep winds; Juno allows us to see past the gas giant’s churning upper layers and directly into its guts. The latest findings in this regard were published across four papers today, all appearing in the science journal Nature. In the first study, led by Weizmann Institute of Science astronomer Yohai Kaspi, scientists have shown that—get this—Jupiter’s atmosphere and its jet streams extend a whopping 3,000 kilometers, or 1,860 miles, below cloud level. To put that into perspective, Jupiter’s atmosphere is so deep you could fit more than two Earths on top of each other and still not reach its full extent. 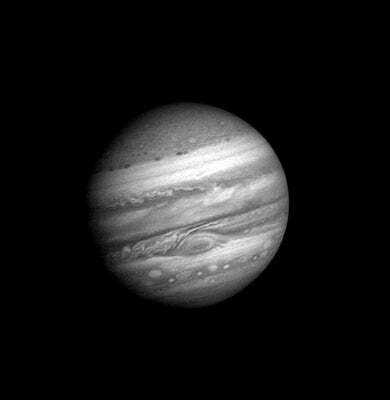 Put another way, Jupiter’s atmospheric flows extend for 1/40th of the planet’s diameter. Below 3,000 km, the winds gradually slow down and decay. The pressure down there is about 100,000 times more powerful than what we find at Earth’s surface. Jupiter’s atmosphere, according to Kaspi’s analysis, encompasses a whopping 1 percent of Jupiter’s total mass, which amounts to three Earth masses. By contrast, Earth’s atmosphere is less than one millionth of the mass of Earth, so the discovery of such a massive interior region, which is rotating in separate east-west bands, came as a complete surprise to the astronomers. These findings were made possible owing to Juno’s ability to detect minute differences in Jupiter’s gravitational field. Kaspi says these findings are important for understanding the nature and possible mechanisms driving Jupiter’s strong jet streams. And because the gravity signature of the jets was found to be tangled up with the gravity signal in the interior, astronomers will now have a better understanding of the interior structure, core mass, and origin of Jupiter. Artist’s depiction of Juno orbiting Jupiter. The second study, led by Tristan Guillot from the Université Côte d’Azur in France, was an investigation into the composition of Jupiter’s atmosphere and the stuff that lies deeper still. Using Juno gravity measurements and interior models, Guillot found that Jupiter’s zonal flows extend to about 3,000 km, which matches Kaspi’s findings rather perfectly. But whereas Kaspi’s team studied gravitational anomalies, or “odd spots,” Guillot’s team analyzed Jupiter’s gravitational consistencies. So these two independent teams reached the same conclusion using different techniques, which is a good sign. Guillot’s team also found that, below 3,000 km, Jupiter rotates uniformly, rather than with zones and belts rotating at differential speeds as in the atmosphere. This is something scientists didn’t know before. As for the composition of Jupiter’s core, we still don’t know the answer, but these latest results suggests it’s not a solid, but a liquid, and that it’s bigger than previous estimates. Guillot said this will be a difficult thing to prove because the pressure down at the core is 50 million times stronger than Earth’s atmospheric pressure. Good luck replicating those conditions in a lab! Juno was directly over Jupiter’s south pole when it took this photo. Luciano Iess, an astronomer at Rome’s Sapienza University, led the third study. His team studied Jupiter’s gravitational field, which is known to vary from pole to pole. But in another complete surprise to scientists, they discovered a pronounced north-south “asymmetry,” meaning the planet’s gravitational strength doesn’t match at the poles. That’s a weird result, because Jupiter is a “fluid” planet that’s rotating quickly, making it oblate, or squashed at the poles. In theory, the gas giant’s gravity, or mass distribution, should be spread equally at the poles. So what could possibly account for this? In the fourth and final study, lead investigator Alberto Adriani from Italy’s National Institute of Astrophysics studied the storms at Jupiter’s polar regions—areas not visible from Earth. By looking at visible and infrared scans of the poles taken by Juno, Adriani’s team was able to document a series of swirling cyclones, all of which produced dramatic polygonal patterns. At Jupiter’s north pole, eight circumpolar cyclones were seen rotating around a single cyclone, and at the south pole, the researchers found five. The exact cause of these storms remains unknown. Jupiter’s south pole as seen at 5 µm wavelength, showing heat emanating from the planet through the clouds (the darker the color, the thicker the clouds). When asked to speculate as to the cause of these cyclones, Adriani said the fast rotation of the planet and the heat coming from the deeper layers of the atmosphere are a likely culprit. “The symmetry of the structures is due to their position around the pole, namely around the rotation axis of the planet,” he said. Looking ahead, Adriani would like to combine the new data with microwave radiometer data to investigate how the deeper atmosphere interacts with Jupiter’s most “superficial” upper layers. So, a lot of questions have been answered, but many new ones are now appearing. Future studies will investigate the depth and structure of Jupiter’s Great Red Spot, along with the forces that might drive the planet’s jet streams. The astronomers are also planning to use Jupiter’s gravitational field to understand more about the planet’s interior structure, including the mass of its central core. This is now possible because, for the first time ever, scientists can finally measure differential rotation inside a gas giant. Scientists are also planning to measure the way Jupiters’ spin axis moves in time, which could reveal the way its density varies in the deepest layers. Finally, Juno will also be used to measure tides raised on Jupiter that are caused by Io and its other moons. This could provide new insights into the complex inner workings of the Solar System’s largest planet.